Businesses can survive without many things, but customers are not one of them. Customers don’t just show up when a business gets off the ground: they are out there already and, for the most part, surviving pretty well without you. Your product, however innovative or new, is primarily only going to displace, dislodge or dislocate an existing supplier’s offering much as emails displaced telegrams, and they in turn overtook the network of pony express-type courier services operating around the globe. From the outset your business plan has to be based on a sound appreciation of exactly what your product or service can deliver in terms of value to its potential user base. Those of us in business usually start out defining our business in physical terms. Customers, on the other hand, think a business’ primary value is the ability to satisfy their needs. Even firms that adopt customer satisfaction, or even delight, as their stated maxim often find it a more complex goal than it first appears. And until you have clearly defined the needs of your customers you cannot begin to assemble a product or service to satisfy them. Fortunately, help is at hand. An American psychologist Abraham Maslow, who taught at Brandeis University, Boston, a top US business school, demonstrated in his research that “all customers are goal seekers who gratify their needs by purchase and consumption”. He then went a bit further and classified consumer needs into a five-stage pyramid he called the ‘hierarchy of needs’. Self-actualisation: This is the summit of Maslow’s hierarchy in which people are looking for truth, wisdom, justice and purpose. It’s a need that is never fully satisfied and, according to Maslow, only a very small percentage of people ever reach the point where they are prepared to pay much money to satisfy such needs. It is left to the likes of Bill Gates and Warren Buffett to give away billions to form foundations to dispose their wealth on worthy causes. The rest of us scrabble around further down the hierarchy. Esteem: Here people are concerned with such matters as self-respect, achievement, attention, recognition and reputation. The benefits customers are looking for include the feeling that others will think better of them if they have a particular product. Much of brand marketing is aimed at making consumers believe that conspicuously wearing the maker’s label or logo will earn them ‘respect’. Social: The need for friends, belonging to associations, clubs or other groups, and the need to give and get love are all social needs. After ‘lower’ needs have been met these needs that relate to interacting with other people come to the fore. Hotel Chocolat, founded by Angus Thirlwell and Peter Harris in their kitchen, is a good example of a business based on meeting social needs. They market home-delivered luxury chocolates but generate sales by conducting tasting clubs to check out products each month. The concept of the club is that you invite friends round and, using the firm’s scoring system, rate and give feedback on the chocolates. Safety: The second most basic need of consumers is to feel safe and secure. People who feel they are in harm’s way, either through their general environment or because of the product or service on offer, will not be over-interested in having their higher needs met. When Charles Rigby set up World Challenge to market challenging expeditions to exotic locations around the world, with the aim of taking young people up to around 19 years of age out of their comfort zones and teaching them how to overcome adversity, he knew he had a challenge of his own on his hands: how to make an activity simultaneously exciting and apparently dangerous to teenagers, while being safe enough for the parents writing the cheques to feel comfortable. Six full sections on the World Challenge website are devoted to explaining the safety measures the company takes to ensure that unacceptable risks are eliminated as far as is humanly possible. Physiological: Air, water, sleep and food are all absolutely essential to sustain life. 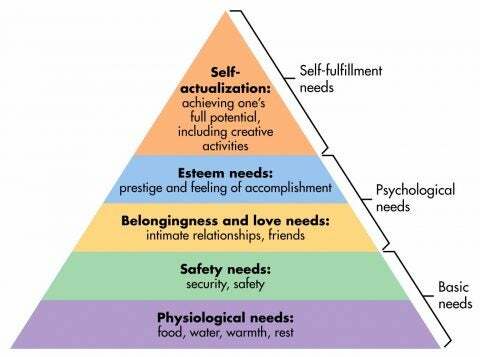 Until these basic needs are satisfied, higher needs such as self-esteem will not be considered. When understanding the needs of business buyers, it is important to keep in mind that there are at least three major categories of people who have a role to play in the B2B buying decision, and whose needs have to be considered in any analysis of a business market. The user, or end customer: This is the recipient of any final benefits associated with the product or service, much as with an individual consumer. Functionality will be vital for this group. The specifier: Though specifiers may not use (or even see) their purchases, they will want to be sure the end user’s needs are met in terms of performance, delivery and any other important parameters. Their ‘customer’ is both the end user and the budget holder of the cost centre concerned. There may even be conflict between the two (or more) ‘customer’ groups. For example, in the case of, say, hotel toiletries, those responsible for marketing the rooms will want high-quality products to enhance their offer while the hotel manager will have cost concerns, and the people responsible for actually putting the product in place will be interested only in any handling and packaging issues. The non-consuming buyer: This is the person who actually places the order. They will be basing their decision on a specification drawn up by someone else, but they will also have individual needs. Some of their needs are similar to those of a specifier, except they will have price at or near the top of their needs. Word spreads slowly as the message is diffused throughout the various customer groups. Even then it is noticeable that generally it is the more adventurous types who buy at first. Only after these ‘innovators’ have given their seal of approval do the ‘followers’ come along. Research shows that this adoption process, as it is known, moves through five distinct customer characteristics, from Innovators to Laggards, with the overall population being different for each group. This adoption process, from the innovators who make up a new business’s first customers, through to the Laggards, is most noticeable with truly innovative and relatively costly goods and services, but the general trend is true for all businesses. Until you have sold to the innovators, significant sales cannot be achieved. So, an important first task is to identify your market’s innovators and tailor your initial proposition accordingly. For more information on analysing your market, as well as a general plan, check out our other start-up business plan essentials: Testing your business idea, Sizing up the relevant market, Understanding your market, Tailoring to different audiences, Preparing for change and growth and Preparing for the oral presentation. Business Plans for Small Businesses, published by Crimson Publishing, is available to buy now.